The effect that people are having on the planet is becoming increasingly worrying, reduce your environmental impact with our 15 easy changes that your business can make today! From plastics to CO2 emissions, deforestation to water pollution, the state of our environment is becoming more and more of a concern. The UN Intergovernmental Panel on Climate Change (IPCC) just released a report that warned us of the little time we have left to stop global warming exceeding 1.5C. According to this group of world-leading scientists, we have just twelve years before it does. So how does that affect us? Well, should that temperature be exceeded, the human race will need to brace itself for more natural disasters like flooding, droughts and then, in turn, poverty and deaths. And of course, the massive shame of destroying natural habitats and causing the extinction of a wealth of wonderful species. So yes, this is an issue for everyone to take notice of because it could very well be you affected by the consequences one day. There’s a lot that your business can do to reduce its impact on our environment, and to make that simple for you, we have compiled a list of 15 really easy changes that your business can make today, some of which will even save you some money! This digital era makes going paperless easy but so many modern businesses are still opting to print paper like there is literally no tomorrow. 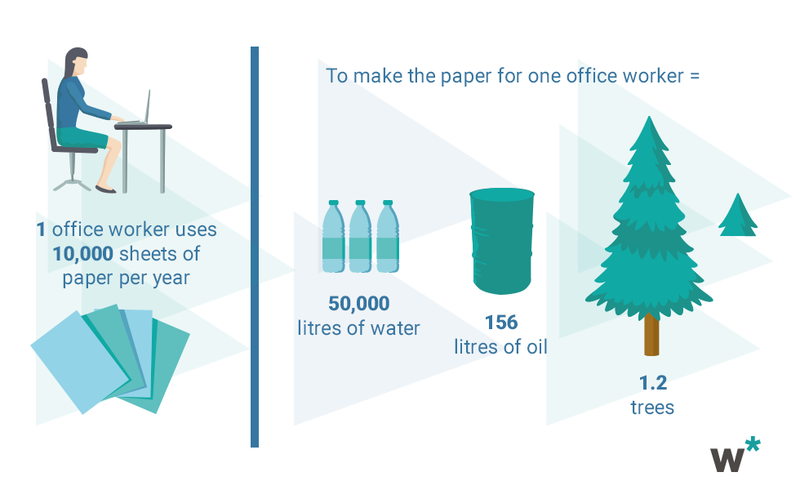 The average UK office worker uses 10,000 sheets of copy paper each year, with 6800 of them considered to be wasted. 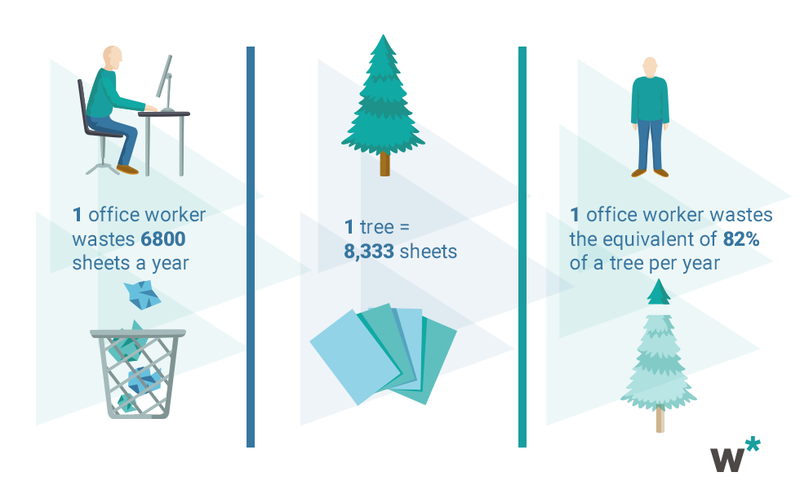 That wasted paper is equivalent to almost a whole tree each. It’s thought that 11 ink cartridges per second and 1 million cartridges per day are thrown away, that’s around 50% of all toner cartridges and 70% of all ink cartridges that are still not recycled or disposed of properly. They get sent to landfills where the volatile organic compounds and heavy metals within them pollute the soil and water, and the plastics they use take can take up to 450 years to decompose. Some components made of industrial grade plastics will take over a 1000 years to decompose. So, maybe it’s time your company went paperless, or as much as possible anyway. Sometimes being completely paperless just isn’t possible, so when you do need to print, be responsible by previewing your prints to avoid mistakes, avoid glossy paper and print double-sided! What else can you and your company do to reduce your impact? Recycle as much of the office waste as you can and take your old batteries to a local battery bin. A lot of supermarkets have these bins in-store! Switch off all of the electricity in the office at the end of the day, and if that’s not possible then be sure that as much as possible is shut down/ switched off. Maybe you could even look into moving toward renewable energies for your office. Improve your office’s insulation and avoid using air conditioning and heating as much as possible, and if you do use it, make sure all of the doors and windows are shut! Use black screensavers on your computer as it consumes less electricity than an animated screensaver, and put your computer on standby when you’re leaving your desk for longer than 15 minutes. Take the stairs instead of the lift, it’ll reduce your energy consumption and improve your health. It’s a win-win! Avoid using non-recyclable plastic bottles, cups, bags etc. Some water cooler companies offer to collect your cups and wash them when they bring your office’s water. There are also some great funky and functional metal bottles out there now, and pair that with a tote bag to put your shopping in on your way home from work. Try using natural light as much as possible, or make sure that your lightbulbs are energy-efficient. This will not only save 25 to 80% of the energy of traditional bulbs but will also save you money. Cycle to work, opt for public transport or car-sharing. Here in the UK, there is a Cycle to Work Scheme which helps you to buy a bike whilst saving 25-39% on the bike and the accessories to go with it, so ask your employer about this! Change your supply chain processes to ensure that they too are trying their best to be eco-friendly, it’s worth researching carbon-neutral options rather than working with non-eco-conscious alternatives. Consider opting for reusable pens which you can just refill with ink, instead of using the cheap plastic biros which eventually get sent off to a landfill. Make the change towards greener cleaning products with fewer toxic-chemicals, these are widely available now in most supermarkets. Get rid of your old electronics responsibly and research what options are available in your area. Don’t let these products end up in a landfill! Get some office plants, not only will they make your office more visually appealing, but they will also help filter your office air. It’ll make your clients and your employees breath better and feel better! Consider collecting all of the office’s waste for a week, this way you can gauge just how much waste your office produces and you can then create goals to reduce that. At Webstars, we will be doing just that, so check back in a few weeks to find out how that went for us! On Sunday 21st February, I joined a panel at UCL as part of NACUE’s Student Enterprise Conference 2016, to discuss the lacking presence of women in technology.